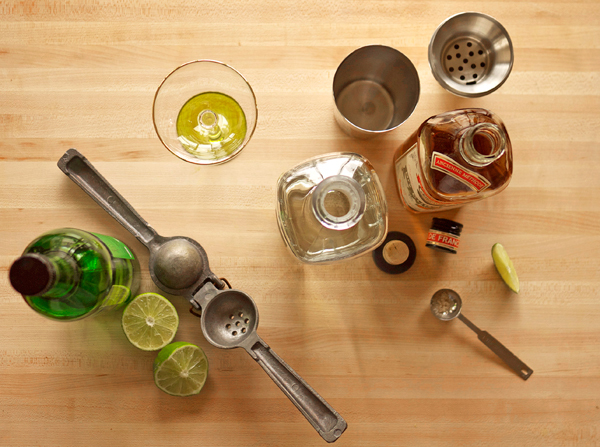 As much as I love throwing together some cocktails when a friend or two stops by, when a small crowd starts to gather I freeze up, spill liquor all over the place and add salt when it should have been sugar. That’s why I love pitcher cocktails for crowds at my house. Besides turning to all thumbs, I’d rather be mingling, drink already made in my hand, then trying to mix and half listen to a story being told to me. Anyone else like this? 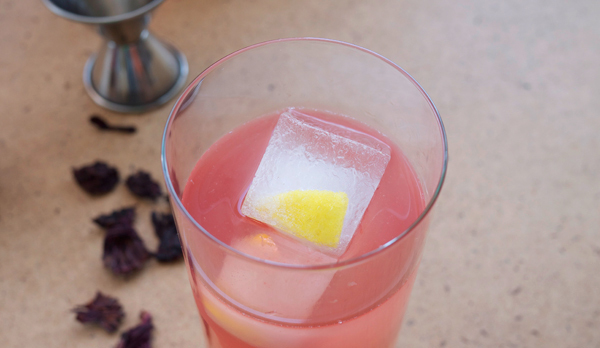 Spring and Summer tends to pack the weekends with parties, and this bright, floral pitcher cocktail is just SO refreshing and delicious you could serve it at least a couple of times before changing it up. Now, I know this is calling for limes. Don’t let that ingredient mean you’re passing this up! 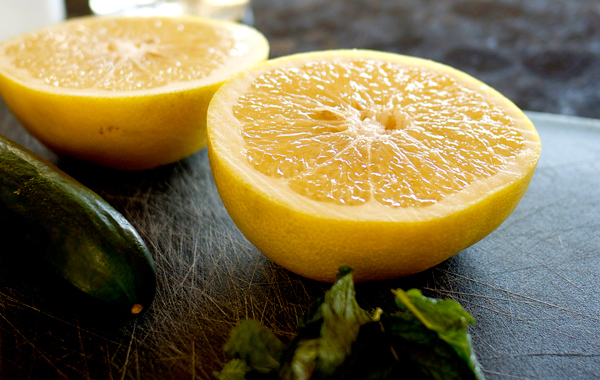 You can easily switch out the lime for other citrus combinations; grapefruit and lemon, kumquats, tangerines… as long as you get a fragrant, slightly sweet and not too sour flavor. Another nice fact about pitcher drinks: they can mostly be assembled beforehand and topped off before the party starts. Less stress this summer; you are welcome. Note: my pitcher is on the small side, serving about 6. If yours is much larger this can easily be doubled (or hell, tripled). And be careful with the hibiscus! This little flower goes from tangy to bitter super fast so don’t walk away and forget about it when you’re steeping. Over medium-high heat, bring sugar and water to just under a boil. Remove from heat and add hibiscus and lime zest. Stir, cover and let steep for 15 minutes. Strain, let cool and add lime juice. 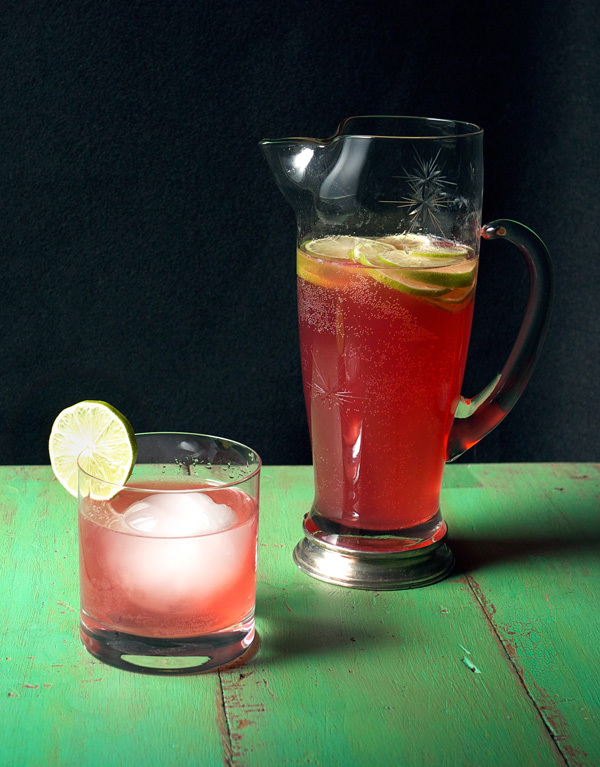 For the drink: In a pitcher, add lime slices, syrup and tequila. If not using right away, store in refrigerator. 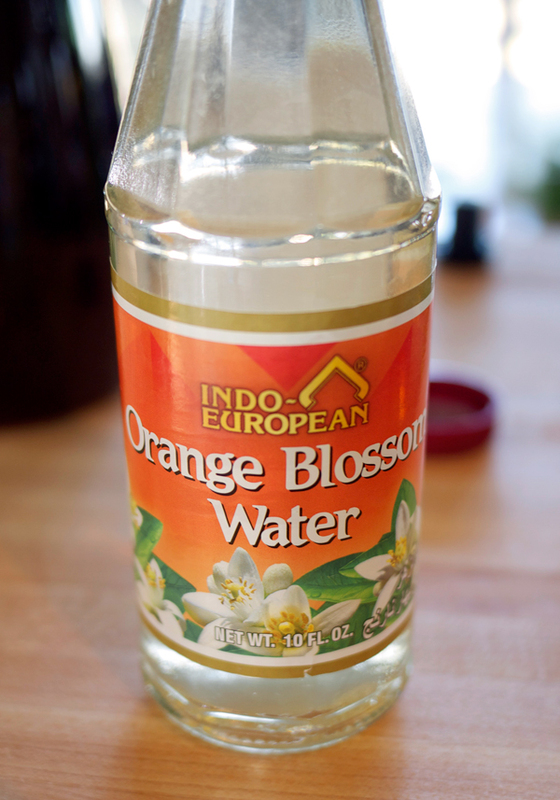 Otherwise, add tonic water and stir to combine. 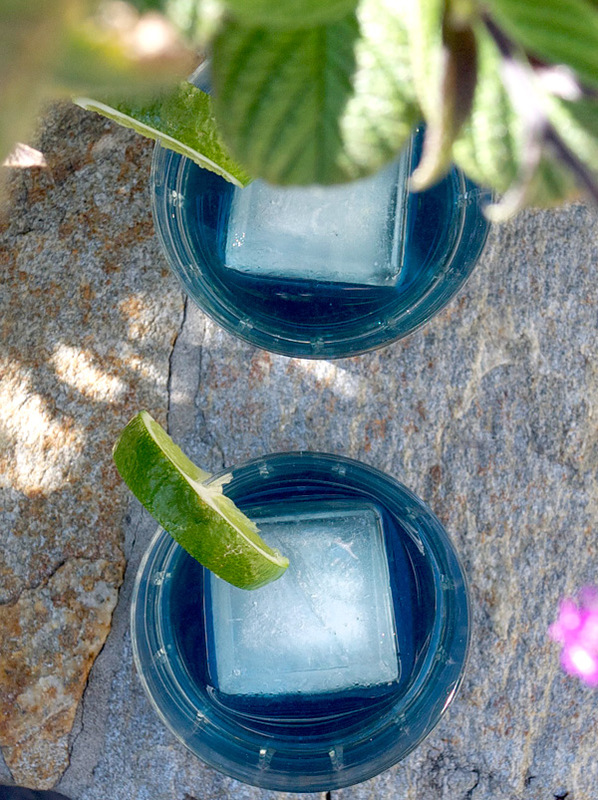 Serve over ice with lime wedges. 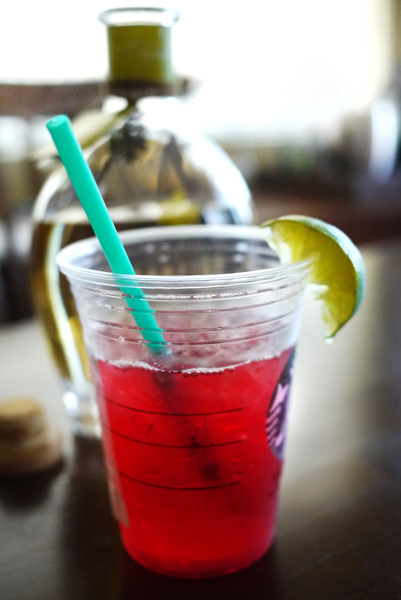 Tart and tangy, the hibiscus-lime mixture provides a lift to the vegetal nature of the tequila. The tonic gives a hint of bitter and sweetness to the final drink, along with a nice effervescence. If tonic is too overpowering for you, club soda can be substituted. This week I’m dialing it back a little with the ingredients. I’m sure you lot would love it if the drink recipe didn’t include a laundry list of items that would mean at least two separate store trips. And possibly an Amazon purchase. I get it; I want simple sometimes too. But let’s not get too lazy. 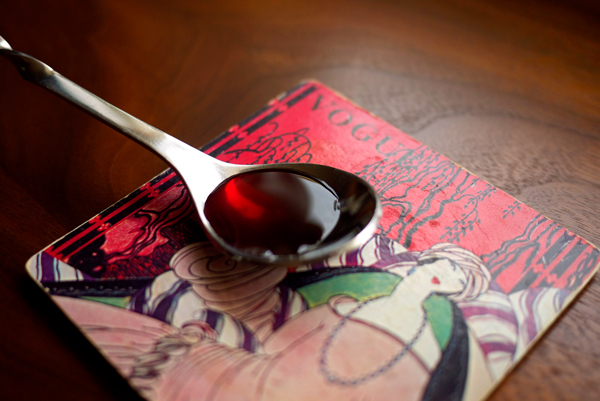 One item I have in my bar at home that may seem odd but worth picking up is violet liqueur. But it tastes like flowers. Well, no, not really. 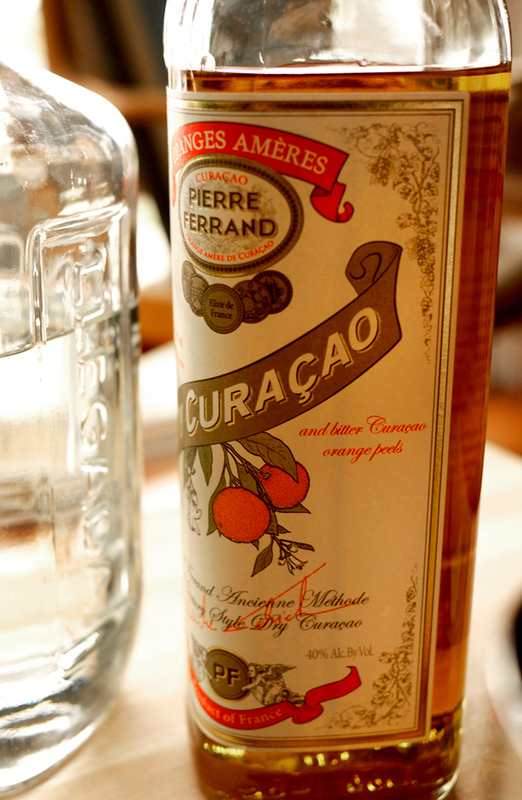 While its uniqueness does come from the floral aroma, it imparts a delicate sweetness as well when used in moderation. You’ve had an Aviation, right? Did it taste like you were choking down a garden? If it did it wasn’t made properly, and if you really want a good one, check out the Improved version. So let’s just get this out there, you will need violet liqueur for this drink. But, everything else you should have on hand, or have a neighbor who could help out. A short while ago I was sent a copy of The Best Craft Cocktails & Bartending with Flair which I’ve been perusing as of late. Besides a multitude of more complex cocktail recipes, which are projects I always love, there were also the smattering of more approachable recipes that one is drawn to since it can be done with ingredients you probably have on hand. Today’s drink stems from one of those. 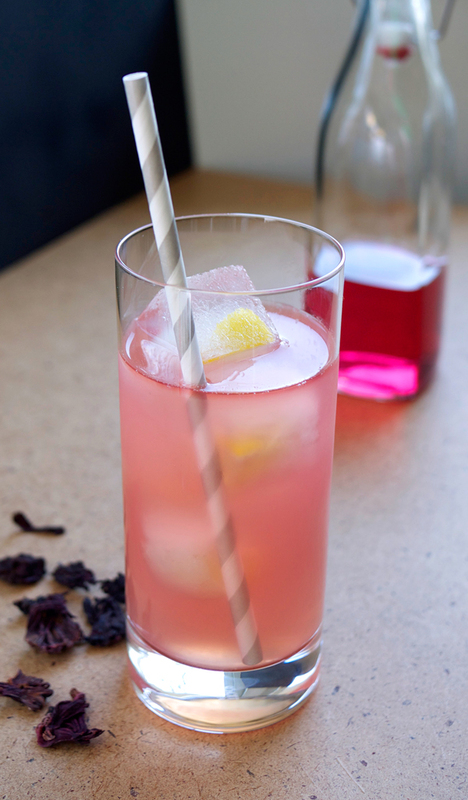 There are just 3 key players in this drink, but the complexity of each ingredient transforms this into a much livelier concoction than expected. Also, it doesn’t hurt that this is an easy drinker and that here in Southern California it’s pretty dang hot outside still in January. 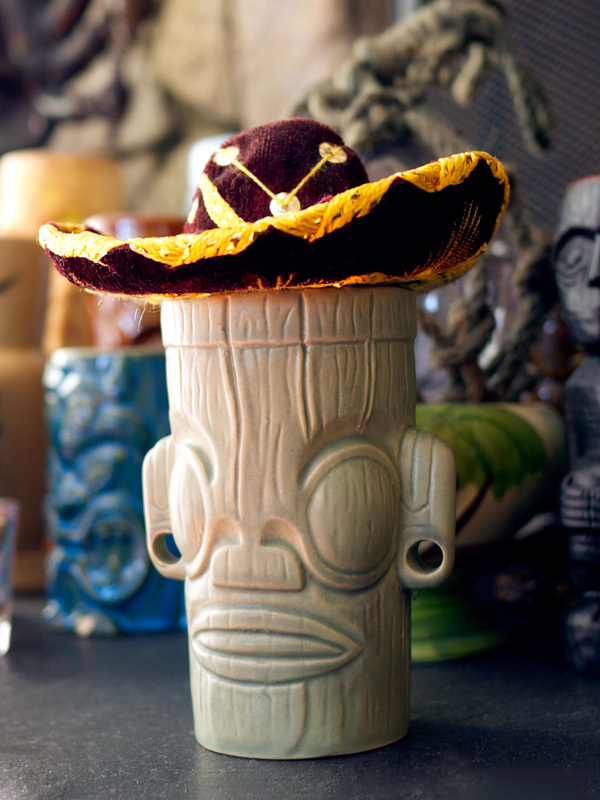 Perhaps you should turn your heat up and make one of these while watching the Travel Channel’s island report show. I swear it will help combat any SAD symptoms you may be experiencing. 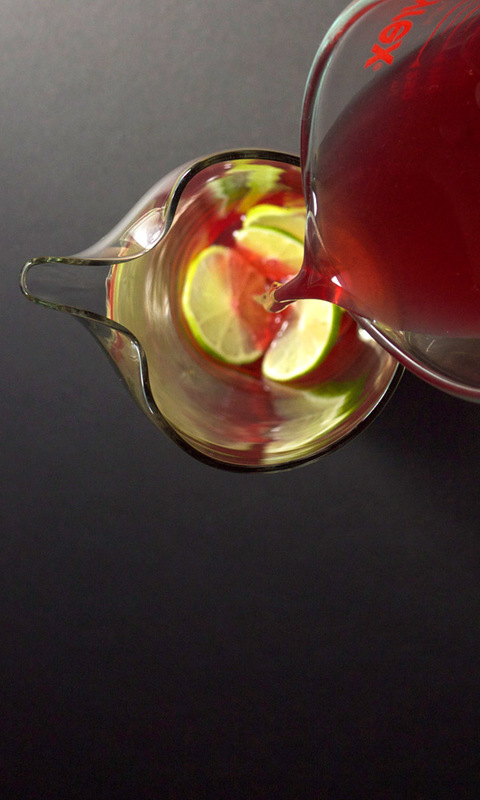 Mix tequila, violet liqueur and lime juice in a mixing glass 2/3 filled with ice to chill for about 20-25 seconds. 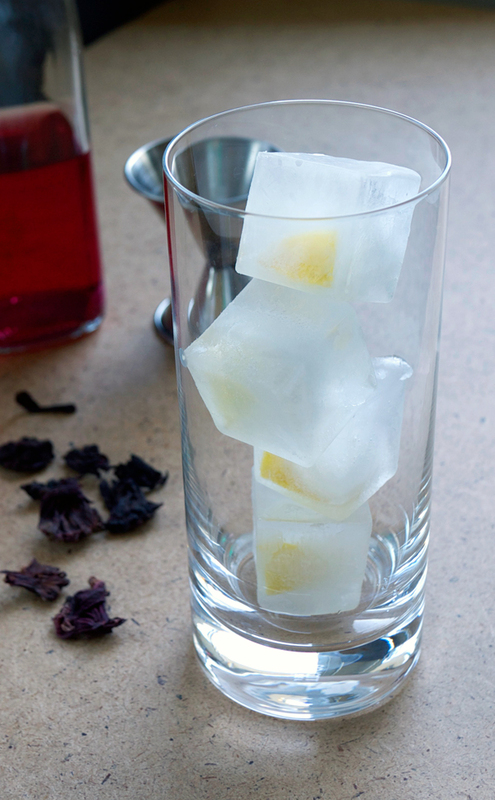 Strain over a large ice cube in a rocks glass. 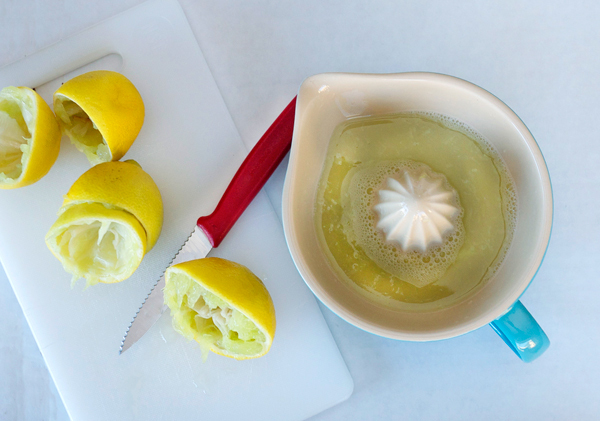 Garnish with the lime wedge. The violet liqueur is one of those “a little goes a long way” ingredients and I believe is actually a good match for another strong character found in the Anejo. I actually cut back the violet a 1/4 ounce from the original recipe and upped the lime juice a 1/4 ounce to balance my own ingredients. The result was a refreshing drink that was both floral and bright, and really a good day drink for me. The tequila I found to be more prominent on the nose but blended nice and evenly once mixed. 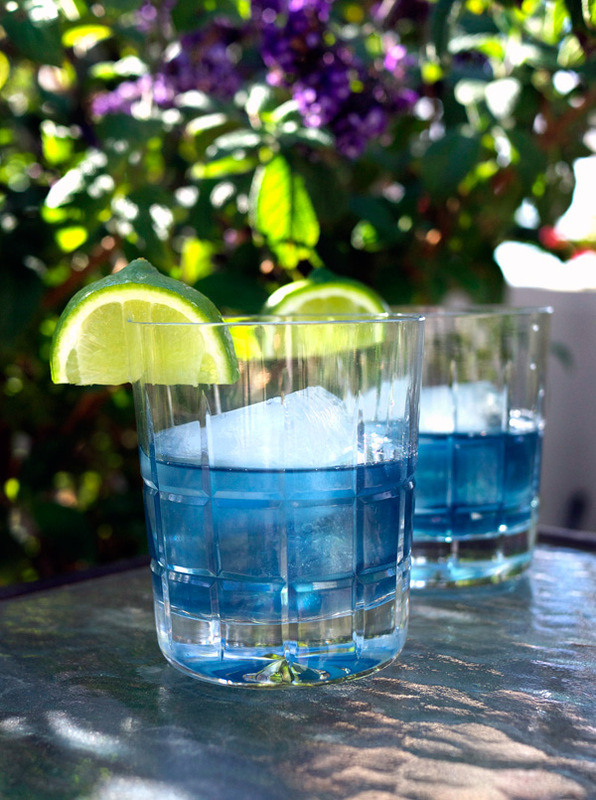 Anyone have any other recipes with Violet Liqueur? I’d love to hear about them! Can a cantaloupe be classy? I think so. No, wait. I KNOW so. But it sat next to the Dijon mustard for 3 weeks. 3 weeks and maybe a few days. Until a bottle of Dobel Tequila showed up on my doorstep. As I have been desperately clinging on to daylight as it starts to get cooler here in Los Angeles, one reminder of summer, besides taco trucks, is melon gazpacho. There is something SO refreshing gulping down this sweet and savory soup. I like mine with a little heat, go figure, and a sprinkling of cilantro. 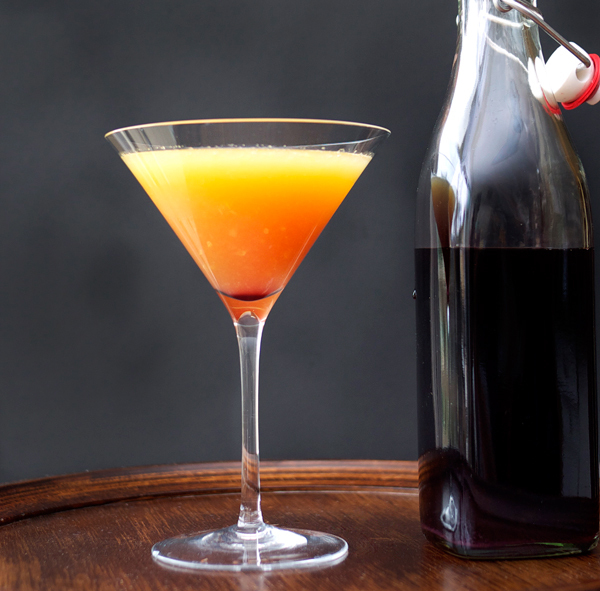 So why not spike this melon syrup with a bit of tequila? In the bottom of a mixing glass, muddle the pepper slices with lime juice. 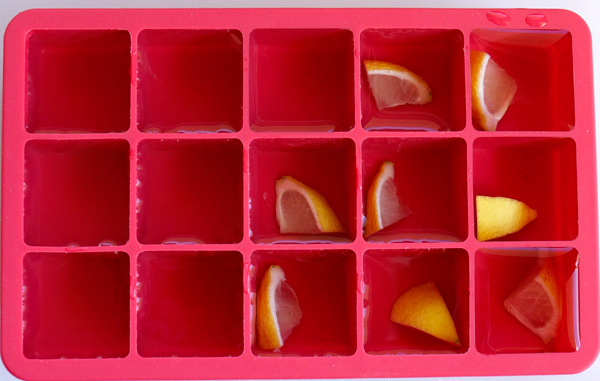 Add ice, then add in syrup and tequila. 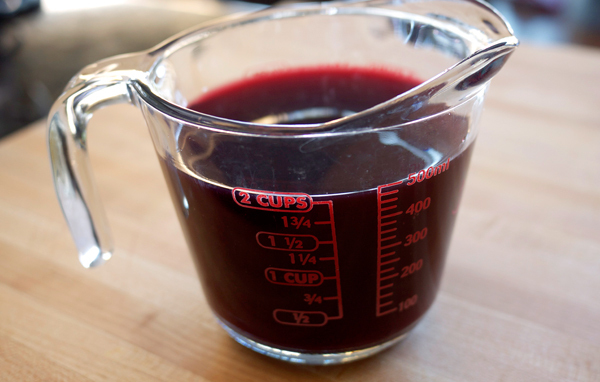 Stir for about 30 seconds and then strain into a chilled coupe. Garnish with a sprig of cilantro. For this cocktail, I wanted to keep the heat to just a flavor and tiny bit of fire. Overpowering the cocktail with too much spice kills the delicate cantaloupe flavors and in turn ruins the drink. 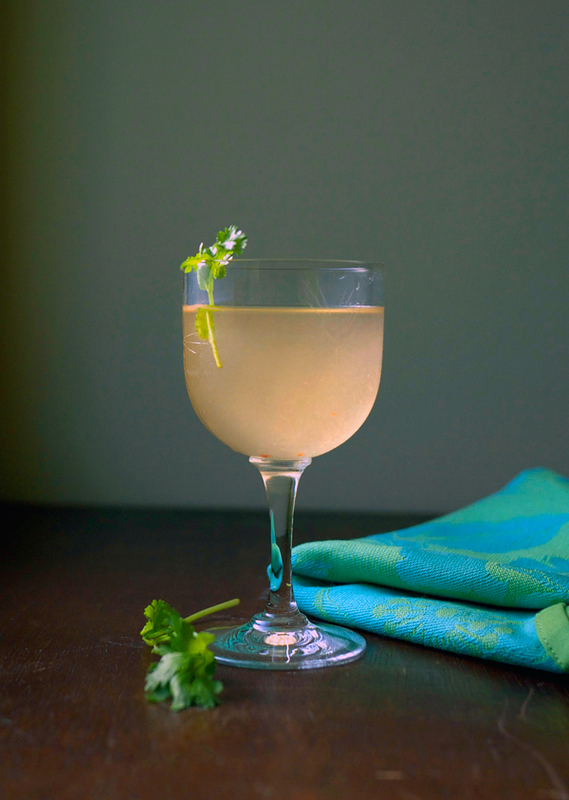 The cilantro gives a nice aroma and you can decide whether to drop it in you drink or not. I almost always want more cilantro on everything, personal preference. 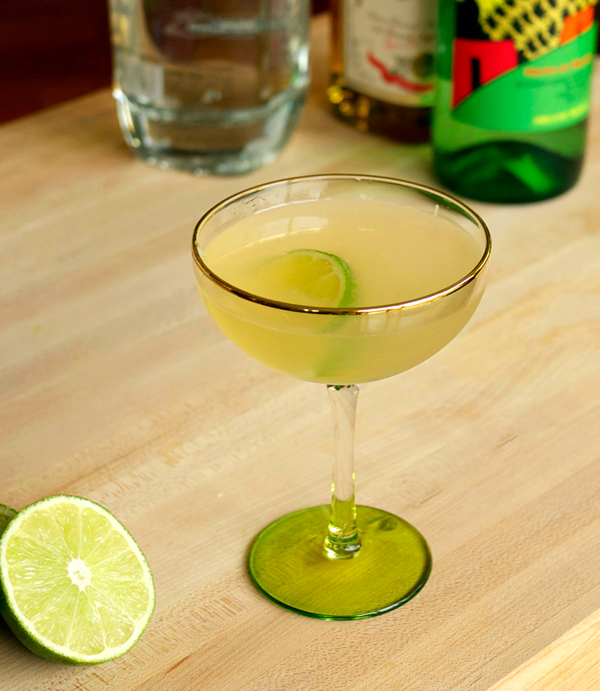 The drink is well balanced between the earthiness of the tequila, the just-sweet-enough melon syrup, tart lime and touch of spice. 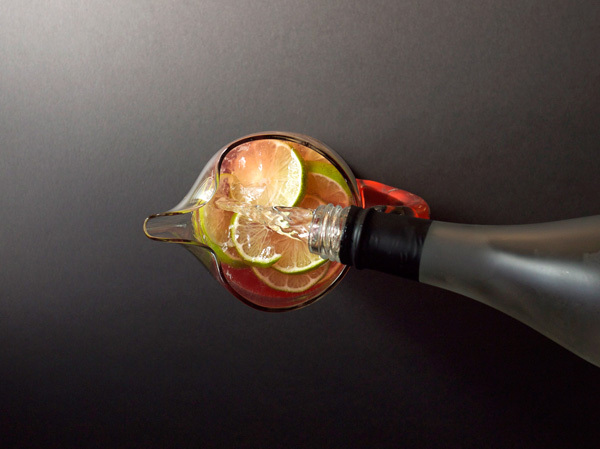 The sudden blush refers to the color the drink takes as you pour it, turning a cloudy silver to a peachy blush color with tiny specs of red from the pepper (yours might have tiny green, orange or yellow depending on your pepper). One word on the garnish. I think the cilantro looks dainty and fragile, Christopher says it looked sad. I think that if we were looking at a bunch of a Ballerinas I would think they looked dainty and he would probably think they were all sad statues. In a nonreactive medium sized sauce pan, combine sugar and water over medium heat. 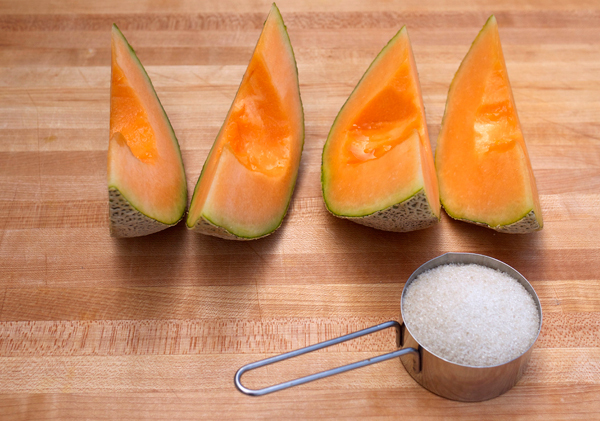 Throw the cantaloupe chunks into the pan and with a potato masher or large fork, crush the melon, breaking it down into the sugar water. You want it to resemble the consistency of a thick soup, with no visible large melon chunks. Bring mixture to a boil and then let simmer over low heat for a half hour. Stirring occasionally. After 30 minutes, remove from heat, cover and let cool completely. Fine strain mixture into an airtight bottle. 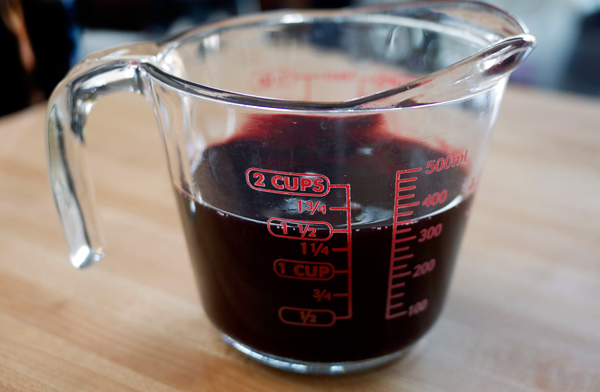 Add 1/2 ounce of vodka if not using entire syrup completely. Refrigerate until ready to use. *This bottle of Dobel was generously given gratis and appears here because I like drinking it. For more info on sponsored products, affiliate links, and gifted booze, please visit the About page. Sundays should be lazy. You shouldn’t have to think that far ahead in your day; events should just roll in and out. And no one judges you if you stay in your soft clothes until Monday morning. This drink came about in that lazy Sunday way. There was definitely a driving force behind it. Mixology Monday was due the next day, and clearly I had to produce something to show for it. Not to knock this month’s theme Drink Your Vegetables, hosted by Fogged In Lounge (whose blog name is so fantastic by the way). This month has just been particularly hard for posts due to outside circumstances, any other month I could have been running wild with fennel and kohlrabi and other vegetables. But here I am on Sunday with a couple cucumbers, and a blender, in my yoga pants. Mainly when I think of cucumbers I think light, refreshing, and I wanted this drink to come off that way. And it does. It’s not very sweet, although it is sweet enough for me. There is an overwhelming taste of cucumbers, which is the point since we are highlighting veggies here, but it’s not like drinking a V-8. The citrus gives a nice sweet-tart bite, while the elderflower and rose water take away some of the ‘green-ness’ of the drink with a peppery finish from the mint. The tequila is very soft in the background, cucumbers are surprisingly overpowering in flavor. I chose to blitz it all with ice since it seemed like a perfect way to imbibe it on this warm afternoon. 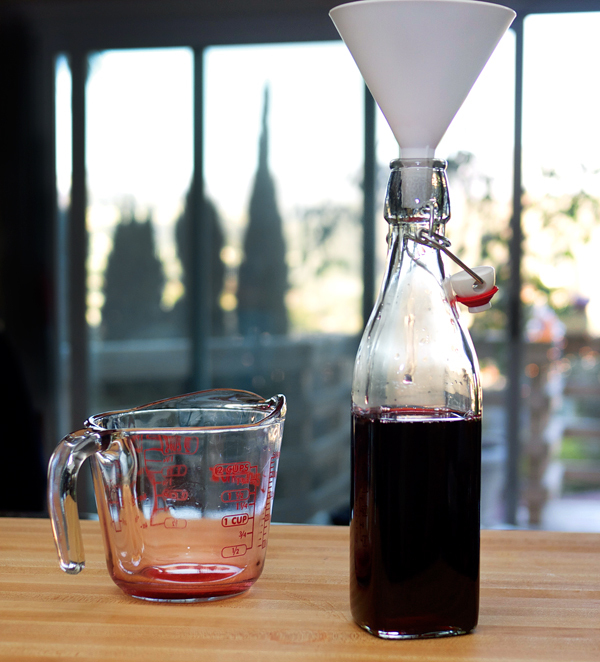 If you find the need for a bit more sweetness, a 1/4 to 1/2 ounce of simple syrup should do the trick. Add all ingredients except ice to a blender and blend for 15 seconds to combine. Add ice and blend for another 15-20 seconds. 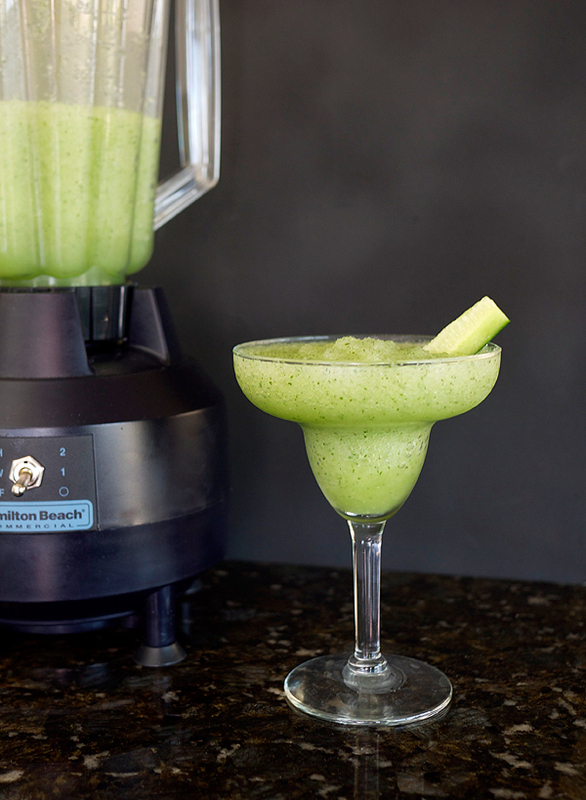 Pour into chilled margarita glasses or oversized martini glasses. Garnish with cucumber spears. I am just realizing that this post is also killing two birds by getting a MxMo post up and getting another round of drinks for two into the mix. Although this makes more like drinks for two and then some.